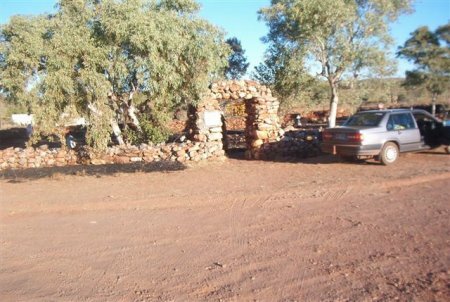 This Halls Creek, at the top of the Tanami Track, was the site of the first gold rush in W.A. in about 1885. The gold rush only lasted about 4 years. Old Halls Creek was more or less abandoned about 50 years ago when a "new" Halls Creek was built on the main road between Kununurra & Derby, The road from new Halls Creek to old Halls Creek is stony dirt but is passable with care by two wheel drive vehicles as well as caravans providing it is not wet! There appears to have been 65 burials between 1895 and 1954 with at least one later burial in 1976. The most well known grave would be that of Jimmy Darcy whose death in August 1917 moved the war from the front pages of newspapers. Darcy had been thrown from his horse on Ruby Plains Station. 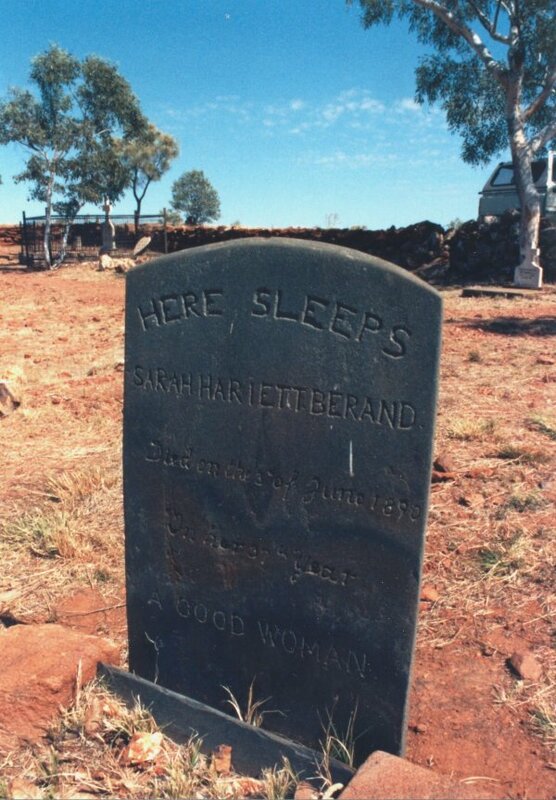 It had taken 12 hours by buggy to get him the 75 kms to Halls Creek. The nearest doctors were normally at Wyndham and Derby but both were unavailable. Fred Tuckett the postmaster had some first aid knowledge and by Morse code contacted Dr. J. Holland in Perth. Holland diagnosed a ruptured bladder and convinced Tuckett he must operate or Darcy would die. Without anaesthetic or proper instruments and with all communications by Morse code Tuckett took 7 hours to perform the required operation. Complications set in and Holland decided to come to Hall's Creek by ship to Derby, by T-model Ford to Fitzroy Crossing then a smaller car which expired about 20 miles from Hall's Creek. These last 20 miles were covered in a sulky. Upon his arrival Holland learnt that Darcy had died the day before! He then performed a post mortem and found that the operations performed by Tuckett were satisfactory and that the cause of death had been the supervention of malaria and a chronic abscess on the appendix. The wide press coverage made city people aware of the need for hospitals and doctors in the outback and contributed to the establishment of hospitals not only at Hall's Creek but at other remote locations by John Flynn ($20 note) and the Australian Inland Mission. This tragedy no doubt helped in the establishment, in 1928, of what is now the Royal Flying Doctor Service. Jimmy Darcy's young brother Charles was also buried in an adjoining grave in 1944.